BMC 2015 exhibition in action. Brighton Music Conference has announced its full lineup for this year's event. Heading up a packed programme of workshops, talks and demonstrations is the Native Instruments 'Native Sessions' to feature Tom Middleton, Henry Cross, Pete Boxsta, Kirk Degiorgio, Icicle, Prolix, Ulterior Motive, Capsun, Hannah V, and Prime Cuts. 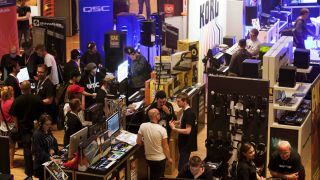 The exhibition will include stands featuring such manufacturers as Roland, Korg, Ableton, Yamaha, Novation, Native Instruments, Warm Audio, Dreadbox, Pioneer DJ and much more. The two-day event is held at Brighton Dome on Thursday 14th April and Friday 15th April and tickets are now on sale: Academy £15 and Professional £99. For more information and ticket purchasing, head over to the BMC website.